Theodore grower David Moore is hoping to replicate his bumper homecoming corn season; however, his decision to plant corn this year will hinge upon the availability of water. Even last year’s call on planting corn after a six-year gap was made based on water availability. 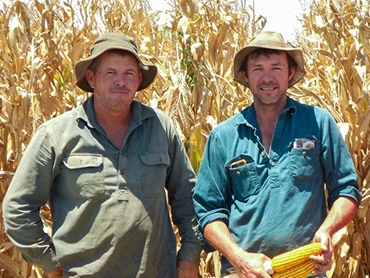 Mr Moore, who farms Lagoona with wife Steffi, his cousin Dennis and Dennis’ wife Kathy, recalls that both their irrigated corn varieties had yielded around 13.5t/ha during the bumper harvest. That customers were willing to buy his product even before seed touched soil was sufficient encouragement for this farmer to transition back to corn. A local feedlot buys all their corn because of the assurance of good quality with high protein content. He said reducing the number of hectares dedicated to cotton to allow for more corn cut back on water use too. Last summer, the Moore family planted 40ha of PAC 727, 40ha of PAC 624, 20ha of PAC 735, along with some MR-Buster and MR-Scorpio sorghum and cotton, all under flood irrigation. Corn planting began on September 22 by seeding PAC 727 at 75,000 seeds/ha on 1m row spacing using a Kinze double-disc opener planter with corn pick-up boxes, which was slightly revised days later. The starting planting rate of 75,000 seemed a bit too high for the 727 variety, so they planted the rest at 65,000 and the 624 also at 65,000 seeds/ha. Prior to planting, Mr Moore pre-irrigated and applied 350kg urea and 50kg Starter Z; in-crop they side dressed 100kg urea and cultivated it in. Starane was used at 250mL/ha pre-plant, Roundup went on at 1.5L/ha pre-plant and a pre-plant, post-emergent spray of Clincher 1.5L/ha was also used. Perfect weather prevailed for most of the season, bringing relief to the family. Though a wild storm did threaten to wreck their second year back in the corn market, the crop pulled through and was harvested in the first week of February. According to Mr Moore, the 727 variety yielded more than the lighter planted 624, which was a surprise. Now that there is strong demand for his feed corn and more water available due to less cotton, a corn crop would be beneficial to Lagoona; however, Mr Moore plans to wait a few more months before making the decision.